On the home ground, my passalong spuria irises are humming with bees, wasps, and other eager pollinators. Growing tall in winter, they flower in spring and brown up in early summer when I cut them to the ground. 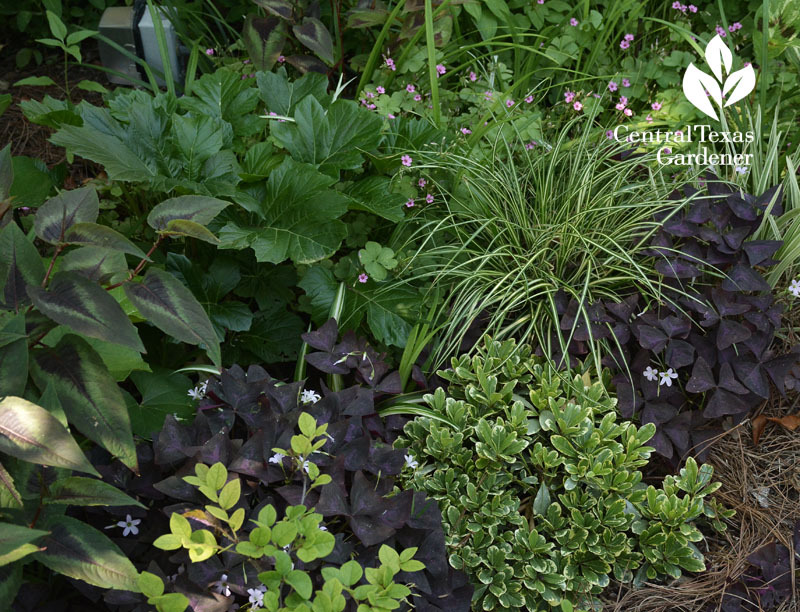 Prolific growers, divide when the foliage browns up or when they emerge in late fall. A few years ago, we had someone lay a rustic patio in the far back corner, formerly home to primrose jasmine. To my delight, native Salvia lyrata (lyreleaf sage) and native Brazos/Gulf penstemon popped themselves into the crevices. With cilantro blooming in the nearby vegetable bed, bees flit from one self-serve buffet to another. When seeds form and turn brown, I’ll harvest and dry in the house for coriander. Taping around town for future segments, a hen strolls down a boardwalk in a backyard pocket prairie. She was more interested in catching bugs, though, than admiring perennial Texas star, pink evening primrose and emerging native clump grasses. At the St. David’s Foundation Community Garden (a project of the Sustainable Food Center), native Copper Canyon daisy is already blooming to entice bees to head over to pollinate robustly growing tomatoes. Normally, Copper Canyon daisy (Tagetes lemmonii) blooms in fall, but cloudy days prompted springtime flowers. Plant now to establish before weather gets hot(ter). Forsythia sage (Salvia madrensis) is another perennial to plant now to keep the food cycle going in fall. Splendid yellow spikes nourish migrating hummingbirds and butterflies. Daphne explains more as our Plant of the Week. We’re getting lots of questions about clumping bamboo. It’s hitting the charts these days for that textural interest and ability to screen even narrow spaces against that big house next door! But, does it really clump and how do you tell the difference between clumpers or invasive runners? 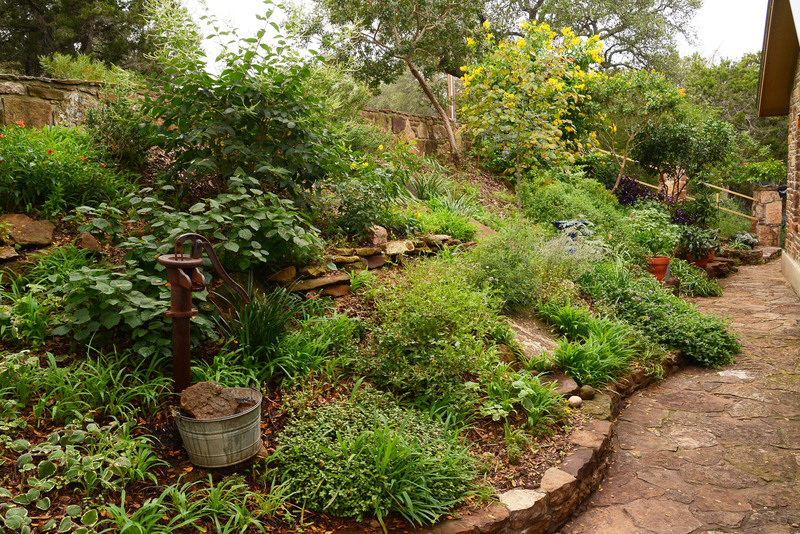 Landscape designer/consultant Merredith Jiles joins Tom to set us straight. An easy way to tell if it’s running bamboo (Phyllostachys) is the ridge or sulcus along the culm. That’s the green one in this picture. The golden culm of a clumping Bambusa multiplex is perfectly round. Merrideth shows off three varieties of clumping bamboos that do spread a bit, but their rhizomes are shorter than running bamboo and stick closer to the plant. Alphonse Karr gets about 15-20’ tall with a 5-6’ spread. He also explains how to cultivate and prune—hedging for height and removing canes for health and architectural interest. Golden Goddess grows to about 10-12’ tall. Green Hedge sticks to about 8-10’ tall. Watch now to find out more and get Merredith’s tips to control running bamboo. Another common question is about browning leaves on container plants. Eloise Hunt’s dracaena has developed yellow leaf margins that eventually turn brown. The edges of Anita Shekar’s avocado leaves are turning brown. Is this a watering issue? Yes, but not what you might think. Daphne explains: “Although the symptoms look slightly different, both plants are suffering from the same problem: a buildup of salt in the leaves, which leads to marginal tip burn.” Get the complete answer on salt buildup and how to avoid it. About that watering: what’s the most common mistake we make with new plants? Not watering enough as roots establish. “But it’s raining so much!” some might say. Well, yes and no. Even after pretty regular soakings recently, when I dug in new plants last weekend, the soil was bone dry less than a foot down. Neil Schmidt from The Natural Gardener explains how to water since deep watering = deep roots=drought strength. On tour, Chandler Ford creates romance front and back in sun and shade. 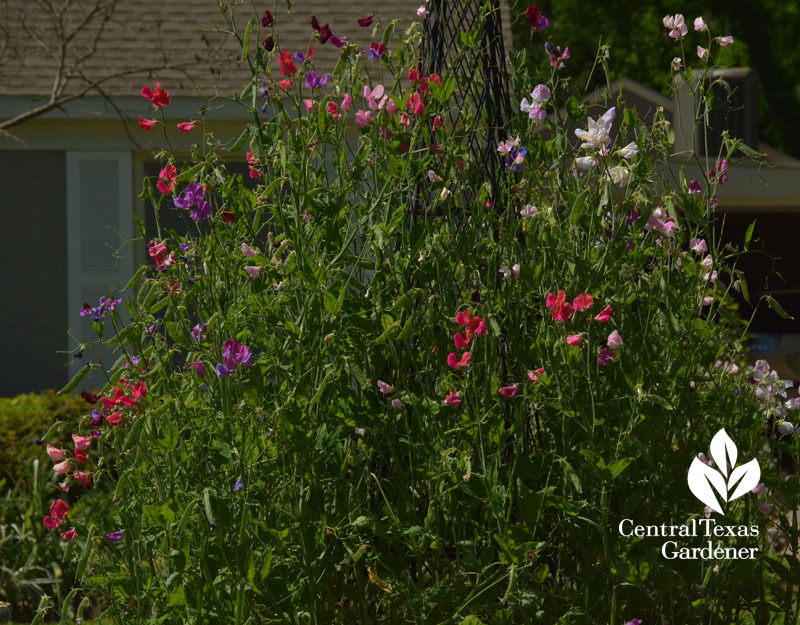 In front, sweet peas, roses like Cinco de Mayo, and poppies draw neighborhood crowds every spring. Like many of us, Chandler has shady spots beyond the sun. A step away from intense color, discover equally sensual colors and texture with Ligularia, Aztec grass, bear’s breeches, dwarf pittosporum, purple oxalis and persicaria. In back, where sun glances against shade, she framed islands of serenity to converse with friends. Trex walkways and patio floor mean easy care. Trex, made from wood chips and plastic grocery bags, is durable and not slippery. Watch her story right now!